Stepping out at the premiere of her new movie, Gnomeo & Juliet, the Brit actress revealed new lighter locks, lifting her signature rich auburn tone to a pretty strawberry blonde. Not one to typically experiment with her hair, the actress has stuck to a shoulder-grazing length and soft curls since hitting the scene, but actually started out as a blonde, switching soon to dark locks and sticking to the hue for the last decade. To debut her new ‘do, Emily hit the London red carpet in a girly white smock dress and dressed for the cold, adding thick black tights and towering black sandals. So there’s the evidence, now we want your verdict! 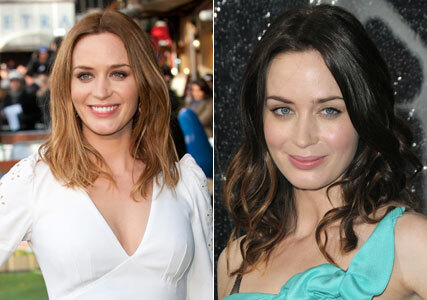 Do you love Emily’s new look or should she return to the dark side? Let us know your thoughts in the comments box below.